It has been quite some time since my last blog post, mostly due to other extra-curricular projects I have going at the moment. It is difficult to find time to write blog posts when family commitments, work, writing a novel for pre-teens, practicing my Akai EWI and resuming an exercise routine I had laid fallow for about half a year, all seem to get in the way. Here's an interesting link to a website that describes how 25 famous people, such as Stephen King, Charles Darwin and Winston Churchill scheduled their day. The thing that strikes me about most of the daily routines described is that these people behaved as if the world revolved around them. Most of them even had a scheduled socializing hour - those friends who could not abide by it be damned! The joke goes that Bill Gates was once caught playing Windows Solitaire during work hours. When faced with raised eyebrows, Bill said, "What? Someone has to test it!" I was in a meeting the other day where four people sat around the table to discuss the implementation of a particular technology into a consumer device. The way the technology was to be implemented had a direct effect on the user experience, so it was important to get it right. It turns out that two of the four people have never actually used the device and one of the four has used it once or twice before. Only one person in the room regularly uses the technology that he develops. "Yes," he repeated, "it might seem logical from a development point of view, but that's not how a typical user would use it. So it would be a bad idea to implement it like that!" I could see the frustration building in his face. I found that some of the most interesting TED talks are those on the subject of human behavior. Dan Ariely's lectures about motivation, choice and morality are fascinating. Which is why I was thrilled to receive Freakonomicsfor my birthday. Steven D. Levitt and Stephen J. Dubner, the authors of this book, treat the world like one big social experiment. They talk about what drives people to behave like they do. They discuss causality - the real factors that lead to the result. What makes this book so interesting is that the authors often overturn common perceptions and widely-held beliefs about how people behave, react, change and, most importantly, how they are incentivized. 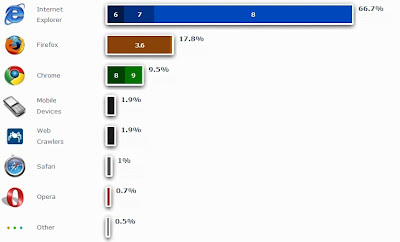 Hanging on to Market Share: Can IE9 Keep Up With the Lads? In my most recent post, I asked you which browser you use. The question was prompted by the news that Microsoft is actively encouraging the 12% of Internet users still running IE6 to upgrade to one of their more up-to-date browsers. The majority of you access this blog via IE, followed by Firefox and then Chrome. These statistics are largely compliant with the worldwide browser usage numbers (see below). In the early days of popular Internet, Internet Explorer killed Netscape Navigator (here's the story: "Netscape Navigator is Dead: The Rise and Fall of Our Favorite Browser".) Surviving a lawsuit that sought to prevent MS from including IE as the default browser in Windows systems, IE held on to the lion's share of the market. However, the tide is shifting. Frankly, the fact that Internet Explorer 6 still has a 12% browser share, it makes Microsoft look bad compared to these younger, better looking and more advanced browsers like Chrome and Firefox.IE9 is currently available as a public release candidate version. Then you have IE8 and IE7. I still use IE7 at work because I'm on Windows XP. I use Firefox at home, but it is starting to feel heavy compared to Chrome, which I'm starting to like. Which browser do you use, and why? Would you consider switching to a different browser? The Internet has run out of space. For the last 30 years or so we have been happily using up the 4 billion available IP addresses. Who would ever have thought that human kind had enough stuff to put up there to use all those addresses? Yet, somehow we managed to exhaust them all. Oops. According to the IPv4 Exhaustion Counter (above and from here), we have until August 2011 until the world crumbles and the skies fall when we run out of addresses. The Mayans were only off by a year and a couple of months. But, have no fear. According to this article in Businessweek we are prepared. IPv6 is finally here and is in the process of being very, very carefully rolled out. IPv6 uses 128-bit addresses, which will provide approximately 11 undecillion new IP addresses. How many is that? What makes you happy? Sunshine? Ice cream? Watching YouTube videos of people hurting themselves? We discovered that the more people use Facebook, the better they feel and that those who share and communicate the most with their friends feel even better.So the more you post, the more you get involved with Facebook, the better you feel. That's 500 million people who swallow the free and legal Facebook happiness pill every day. There's a bit of Facebook sunshine for most of us. Unfortunately, Facebook wasn't such a thrilling ride for Kamisha Richards who was stabbed and killed by her friend, Kayla Henriques, following a spat on Facebook over a $20 loan. Not such happy times.